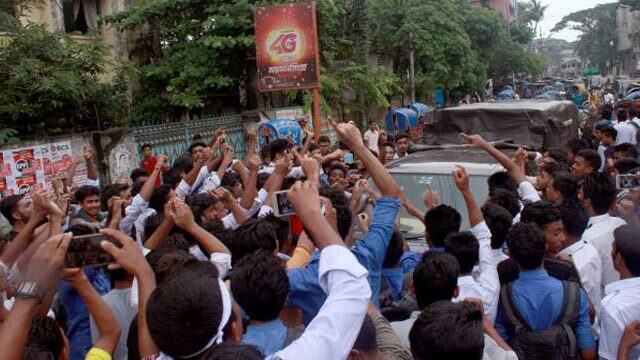 Dhaka, Aug 2 (Just News): Students of different schools and colleges took to the streets for the 5th consecutive day on Thursday, demanding punishment of those responsible for Sunday's road accident that killed their two fellows in the city and resignation of the Shipping Minister for his comments on the accident. School and college goers in different parts of the country, including Chattogram, Rajshahi, Faridpur and Chuadanga, districts staged demonstrations to press home the same demands. Witnesses said a group of students of Rajdhani Ideal School and College gathered in Mouchak area in the city and continued their demonstrations. Besides, students blocked streets at Dhanmondi 27, Kabi Nazrul Govt College road, House Building areas in Uttara, Science Laboratory area, in the morning. Meanwhile, the students of Mohammadpur Government College and Mohammadpur Central College blocked Asad Gate area around 10 am, halting traffic on the busy road. They were also seen checking license of vehicles plying the streets. A group of BAF Shaheen College students took position on the streets at Mohakhali, halting traffic from Farmgate to Satrasta intersection around 12 pm. The students also blocked Rampura, Shewrapara road and checked the licences of drivers halting different vehicles. Students of Daffodil University blocked Mirpur road, disrupting vehicular movement. Besides, around 1000 students took position at Shahbagh intersection in the city, blocking traffic. They also chanted slogans 'We want justice' and resignation of Shipping Minister' during the agitation programme. Students from Sirajul Islam Medical College took position at Bangla Motor area and checked the licences of drivers. They stopped two police vehicles and seized those for not having licences. Students' demonstrations were also seen in front of Motijheel Ideal School, Arambagh and Kakrail intersections. In Chattogram, students of several schools and colleges took to the streets demanding safe road. They also brought out rally at various points of the port city. Vehicular movement from Dewanhaat to Baddarhat road came to a halt following the agitation programme. Students were seen checking the licences of drivers in Dampara area of the city. In Rajshahi, students staged demonstrations at Sahebbazar Zero point in the city and held a human chain there demanding safe road. In Chuadanga, the students took position at Shaheed Hasan Chattar and Government College in the district town demanding exemplary punishment of the responsible bus driver and safe road. They also demanded resignation of Shipping Minister Shahjahan Khan. They put up barricades on Chuadanga-Meherpur and Chuadanga-Jashore road, disrupting traffic. In Faridpur, students from Zila School, Faridpur High School, Police Lines, Rajendra College and Yasin College staged protests at different parts of the district town demanding justice of two fellows killed in Dhaka road crash. They also brought out a protest rally which paraded different important points of the district town.